Parent-teacher conferences matter. Studies show that students perform better academically and have fewer behavior problems when parents meet regularly with teachers. 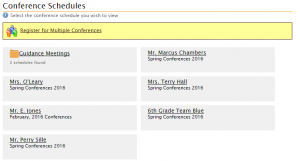 Schools using MyConferenceTime report an increase in parent-teacher conference participation. Isn’t it time for your school to take the next step for better results? MyConferenceTime helps your students and teachers succeed. MyConferenceTime increases parent-teacher conference participation while eliminating the headache of out-of-date scheduling procedures. Scheduling is done online so teachers can focus on students and instruction. Notify parents that the schedules are ready. Watch the parents sign up! Parents want to sign up for teacher conferences quickly. MyConferenceTime will take care of it for you. 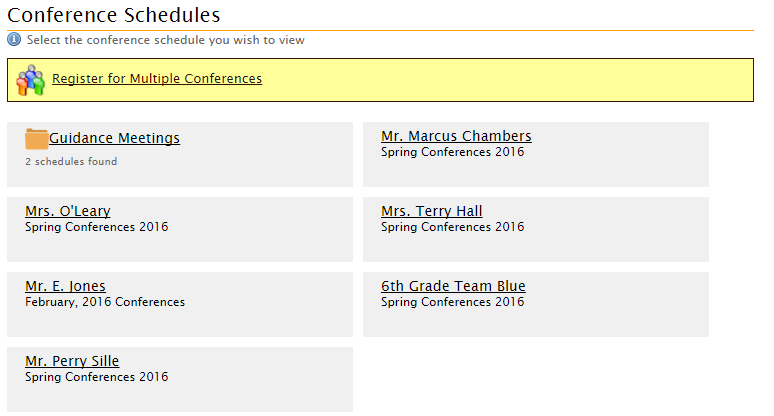 Our web-based scheduler for parent-teacher conferences allows parents to sign up using any web browser. Works with traditional parent-teacher conferences as well as student-led conferences. Our web-based parent-teacher conference scheduler repeatedly is praised for its ease of use, low cost and excellent customer service. Read more about MyConferenceTime or look at an example to see just how easily accessible your conference schedule can be. As always, feel free to contact us for more info.